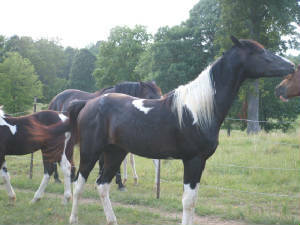 It was a great pleasure raising Lucky's Ole Paint on our farm. His offspring all have his gentle personality and ease of working with. 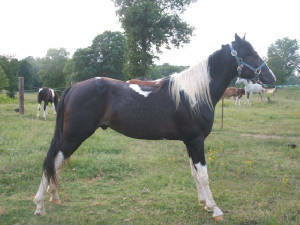 I sold him to a farm in Lousiana where he could reach his full potential as a stallion. I kept too many of his fillies and I could never sell his mom. It was too much constantly making sure he did not breed the wrong mare. I highly recommend him and will pass along the new owner's name and internet site to someone looking for a stallion to breed their mare. 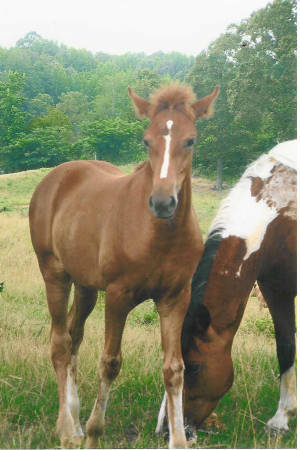 The red filly below was born in March 2007. She is a full sister to Foxy's Lucky Lady. She is very gentle and has 4 beautifully marked stockings. We call her Socks. We will sell her for $700 as a weinling in the fall of 2008.